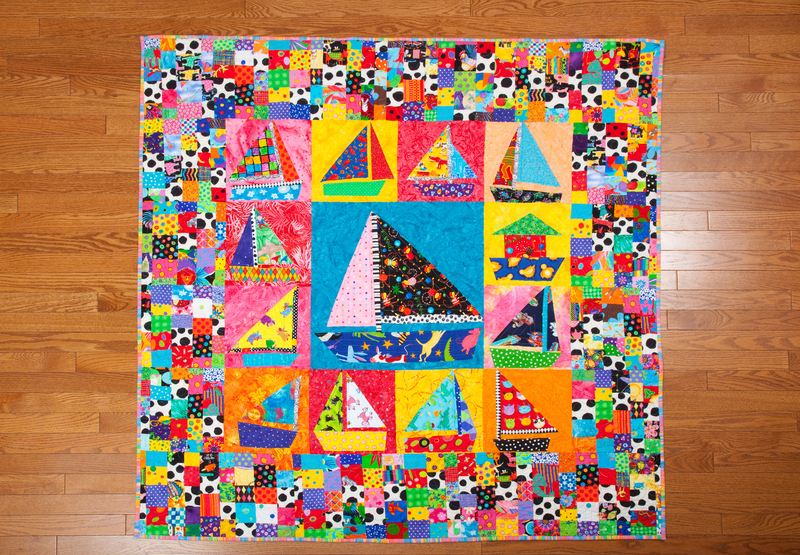 When I made this sailboat quilt, I was experimenting with background colors. I was trying to see what would liven up my boats so they didn’t look so much like stiff little soldier boats all in a row. Because we certainly would not want that…hee hee! I was also goofing around with variations on my boats such as invisible masts and booms, hull shapes and even an ark just for the heck of it. This quilt now lives in Japan with a young woman who came to San Francisco with 5 other High School team members to sail for a week. They had come from the tsunami area and were at sailing practice when the tsunami hit. Fortunately their coach got them all out of the water and up a hill to safety. All of their boats and equipment were lost. They were a remarkable group of young men and women. We had such a ball with them and will always remember the week they spent with us. What a special way for your Japanese friends to remember their American sailing experience! 🙂 We will always remember them too! Visiting from FIUF. I’ve just been enjoying reading back through your blog. Your quilts are so gloriously colourful! Hi Catherine – thank you 🙂 I am going to pop over to your site right now! The sailboats are really neat. I love all of your quilts; they are truly unique! Thank you Diana! I see you have been quite bust too! Love the baby quilts!!! Love the sailboats that is a cute design. Your quilt is wonderful but I really like the story that goes with it. ← Jungle Creatures Project – Completed!